There is no wonder that Victoria’s Great Ocean Road is one of Australia’s greatest jewels and it's easy to see why. Whether or not the weather is favourable this coast line does not disappoint in any circumstance. Taking the drive along The Great Ocean Road offers you ample amount of opportunity to stop and admire the coastline. On day one we explored the Split Point Lighthouse in Aireys Inlet. Opened in 1891 and standing at 34 meters high, this lighthouse is not to be missed. We wandered at a leisurely pace and didn’t miss the opportunity to head to the beach just beneath the lighthouse to take in a different perspective and also enjoy a little stroll along the beach. Day 2 was more action packed. Starting our morning off with one of Jan Juc’s best local breakfast spots, Swell Café did not disappoint. The laid-back atmosphere and delicious food was a great start to our day. With our bellies fuelled we headed off to explore Point Addis. We sat on the rooftop of our car and enjoyed a cup of tea and hot chocolate and took in the views. Point Addis offers boardwalk look out points, a beach and two trail walks. The Ironbark Basin circuit walk and the Koori Cultural Walk. The Ironbark Basin circuit walk is about 7 - 10.5 km which would take about 2-3.5 hours to complete. We opted for the Koori Cultural Walk which is a 2km return trip. The view at the Koori lookout was worth carrying my daughter in her hiking backpack all the way up and back. 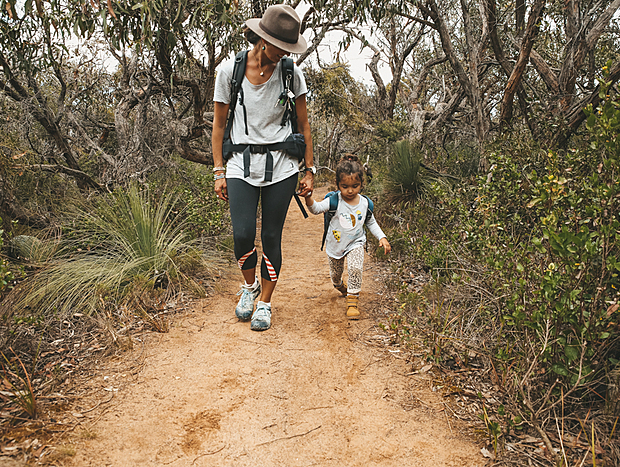 If you are taking the little ones, be prepared to carry them as only part of the walk is flat surfaced. In the afternoon we took the coastal walk from our villa down to the world legendary Bells Beach, just a short 20 min walk to watch the surfers catch the famous Bells waves. On our way back, we stopped and watched the kangaroos graze in the paddocks much to my daughter's delight.